President Reuven Rivlin took part Thursday in celebrations marking the 40th anniversary of the establishment of the town of Elkana in Samaria as part of the celebrations of the 50th anniversary of the return of the Jewish people to Judean and Samaria. Opposition Leader Yitzhak Herzog (Zionist Union) also attended the event. MK Herzog wrote on his Twitter account: "I was happy to honor the residents of Elkana on this 40th birthday together with Reuven Rivlin and others. We're friends despite our arguments." "When we pass through the streets of Elkana today, it;s hard to believe that it was once a pioneering act to come here. Today, Elkana is an empire," Rivlin said. "A well-tended local council with kindergartens, schools and a magnificent teachers' college." "When I came here today and looked around, I cannot help but continue to admire the growth and the momentum of what you have built here in the heart of Samaria," the president added. Rivlin spoke of how the town's namesake, the father of the Biblical Prophet Samuel, made the pilgrimage to the Holy Tabernacle in Shiloh and encouraged other people to come with him. "He was a pioneer at the head of the camp, but he made sure to keep in touch and connect with the people," he said. "Every pioneer must maintain eye contact with the public. Otherwise he would not survive. The mountain must be connected to the coastal plain and the pioneers of Judea and Samaria must be connected to the people of Hasharon, Tel Aviv and Gush Dan. "Here in Elkana they always knew how to connect - how to connect between the mountain and the plain, how to connect different people and different positions, how to connect between pioneers and entrepreneurs," Rivlin stressed. "Not every settlement in Judea and Samaria has had founders who would go on to have key roles in the State: a chief of staff, a defense minister, a legal adviser to the government, and vice president of the Supreme Court, Knesset members and members of the government. I was privileged to serve in the Knesset with some of the founders of Elkana and other members of the community," Rivlin said. 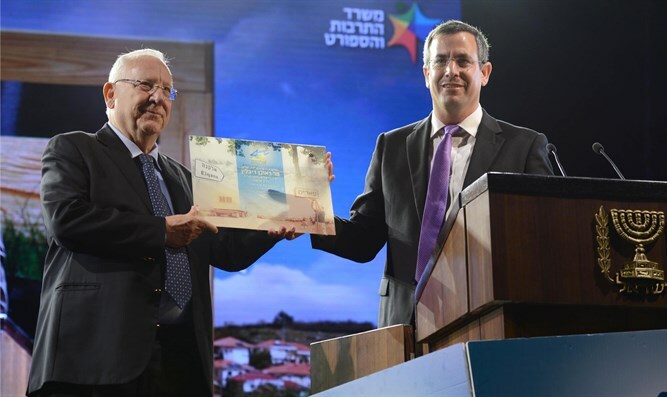 "Elkana, like many other settlements, was established by Yitzhak Rabin's government on the tenth anniversary of the liberation of Jerusalem," the president said at the end of his speech. He stressed that "Elkana is proof that the land of Israel does not belong to one party or another, or to any side of the political map. Everyone loves the land of Israel."